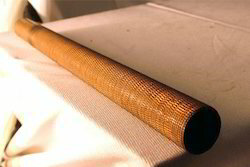 Base Tube Material Copper, SS, MS, Al, Brass Etc. 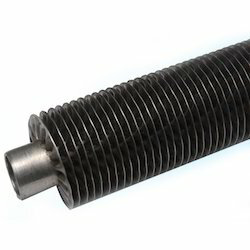 Being the most respected organization guided by experienced and knowledgeable professionals, we are offering a fine quality Spiral Wound Fin Tubes that are used in food industry. The offered fin tubes are manufactured by our prestigious professionals using the best quality raw material and cutting edge technology. Our provided fine tubes are passed through various tests on different parameters. Moreover, these fin tubes are available in different sizes and thickness. Our precious clients can avail from us an optimum quality range of Finned Straight Tubes. Widely used for the exchange of low heat transfer fluids, we offer these tubes in different thickness and specifications. As per the needs of our clients, we manufacture these tubes by using the best quality raw material and ultra-modern technology by our adept professionals. Moreover, these straight tubes are tested on different parameters so as to ensure its quality. We offer a diversified gamut of quality approved Endcross Tubes that are used in vapor absorption chillers. These offered tubes are manufactured using premium quality raw material and sophisticated technology in line with industry norms. Our offered tubes are checked against different quality measures so as to ensure their quality. Apart from this, we offer these tubes in different sizes, thickness and specifications. We hold expertise in offering a high quality range of Fin Tubes that are used in refineries, chemical and petrochemical plants. Our offered tubes are manufactured under high mechanical tension bonding process using optimum quality raw material by adept professionals. 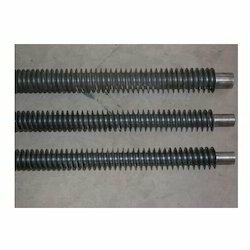 Moreover, these tubes are available in variegated dimensions and specifications. Our provided tubes are strictly tested on different parameters so as to ensure their quality. Our firm specializes in offering an excellent collection of Fin Tubes. The offered tubes are manufactured using high grade raw-material and progressive technology in adherence with industry norms. In order to ensure the defect free product at clients' end, these tubes are checked against different parameters. 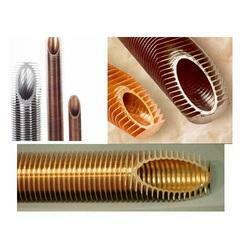 Our provided tubes are available in different thickness and specifications as per the varied needs of our clients. The finning is a procedure of producing by impinging rotating discs mounted on 3 equally spaced arbours, onto and into the surface of the blank which has slipped over a mandrel. In the finning process, most of the metal movement is radial, with some circumferential movement. The blank tubes are stacked on the side table of the machine and the blank is loaded on to the machine mandrel as per the length of the plain required. The tube may be finned for full length without any skip on manual setting or for skips if required the auto switch may be selected. The tube with landing may be manufactured as per the requirements. After finning the tube is sawed to length and racked in finished material rack. Then all, the tubes are tested on pressure testing systems as per the clients or standards requirements. The tubes may than be forwarded for "u" bending or stress relieving if required or kept ready for dispatch. Pipe Bending Capacity Pipe Bending Capacity for different radius bending as per the clients requirements. Abrasive Cut off Machine 300MM Capacity. Profile Projector (10X) for Fin Profile. 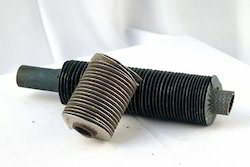 Looking for Ferrous Low Fin Tubes ?